Although most manufacturers have a primary focus on X470 chipset motherboards, AMD has made it clear that the B350 chipset will be sticking around for a long time. 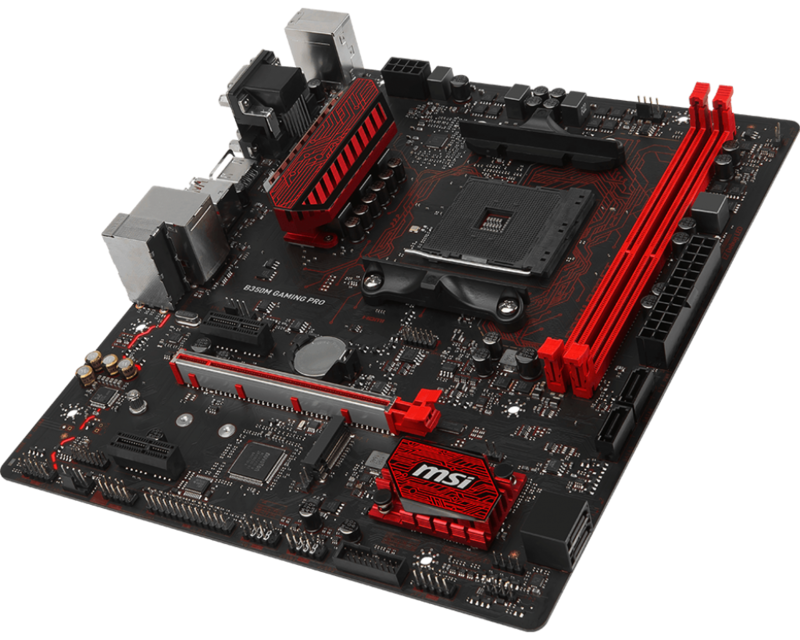 The MSI B350M Gaming Pro aims to offer gamers a lot cost option on the smaller mATX form factor, without all the glitz and glamour of RGB LEDs and over zealous power delivery configurations. With its low price, MSI has gone with a relatively basic layout across the majority of the PCB, which is inline with it being a budget board with a ‘less is more’ mantra; this is especially attributed to this particular model primarily due to the price. The heatsinks feature a stylish and futuristic looking pattern with a red and black design, with silver accents around the edging. Another important aesthetic feature is the all-black PCB with a red pattern predominantly located around the socket; this pattern largely resembles circuit traces and tracks. When motherboards get labeled up as gaming, this can usually signify multiple things such as the color scheme, usually red or with red accented heatsinks, as well as featuring high-end features such as uprated audio codecs and networking capabilities. This can also includes software marketed to give an advantage during gaming. In order to keep down costs, the B350M Pro Gaming makes use of the Realtek ALC887 audio codec which is commonly featured on boards in this price range. The codec is complimented by a quadruplet of Nippon Chemicon audio capacitors as well as featuring a degree of PCB separation. The networking is driven by a Realtek RTL8111H which consists of a single Ethernet port located on the rear panel. The storage options consist of four SATA 6GBs ports controlled by the AMD B350 chipset with RAID 0, 1 and 10 arrays being supported. Also included is a single M.2 slot located directly below the single full-length PCIe 3.0 x16 slot which does itself feature the MSI Steel Armor slot protection. The M.2 slot supports PCIe 3.0 x4 capable drives, as well as SATA; a maximum of M.2 2280 (22 x 80 mm) are officially supported. The board has a single DVI-D port, an HDMI 1.4 port and a VGA port giving users the facility to use older monitors. The rest of the rear panel houses the boards USB capabilities with a total of six. These are split into two USB 2.0 and four Type-A USB 3.0 ports; due to the budget nature of this board, there are no Type-C or USB 3.1 Gen2 ports present. The rest of the rear panel consists of a single PS2 keyboard/mouse combo port, a single LAN port and three 3.5mm audio jacks for the onboard audio. Just like with mITX motherboards, the B350 Pro Gaming has two RAM slots with dual channel DDR4 support, with a maximum capacity of up to 32GB installed. While X470 does have improved memory compatibility with faster modules over the first generation AM4 motherboards such as this one, the B350M Pro Gaming does offer support for DDR4-3200 (OC) which is good for a board at the entry level price point. The B350M Pro Gaming has a modest power delivery setup consisting of a 3+2 phase configuration with a Richtek RT8894A PWM controller leading the charge of the components. The VRM cooling comes via a single heatsink which is rather unassuming for users wanting to do run higher levels of voltage for overclocking on the AMD Ryzen processors such as the Ryzen 7 1700 ($220) used in our test bed, or the newer second-generation Ryzen 7 2700 $299 which with an updated BIOS, does support the newer chips. With the performance, the results given in comparison to other boards on test were to be expected, with the weakest showing coming from the audio testing; a case of a Realtek ALC887 versus the ALC892/1220 offerings on the other boards being a stretch too far to compete with. The strongest aspect of performance on the B350M Gaming Pro came in our 3D point movement calculations test, 3DPM, with further strong showings in our Handbrake encoding tests. The board also displays good figures in power consumption for both idle, and our long idle tests, only with this coming undone at full load to produce one of the highest results seen on an AM4 motherboard. It's clear that the primary use for this board comes through budget gamers looking to shave off unnessacary features and overzealous packages to drive the overall price down. Where the Realtek ALC887 and Realtek RTL8111H controllers are more than ample for anyone looking to do general computing related tasks and gaming, they don't exude the level of premium other boards ingest into their lower tier offerings. The mATX form factor segment is rather crowded on the B350, B450, X370, and X470 chipsets. Whilst the stripped-down versions of the cheaper chipsets on Intel motherboards such as B360 features a lockdown on overclocking, AMDs B350 is fully unlocked to support overclocking on the Ryzen range of processors. 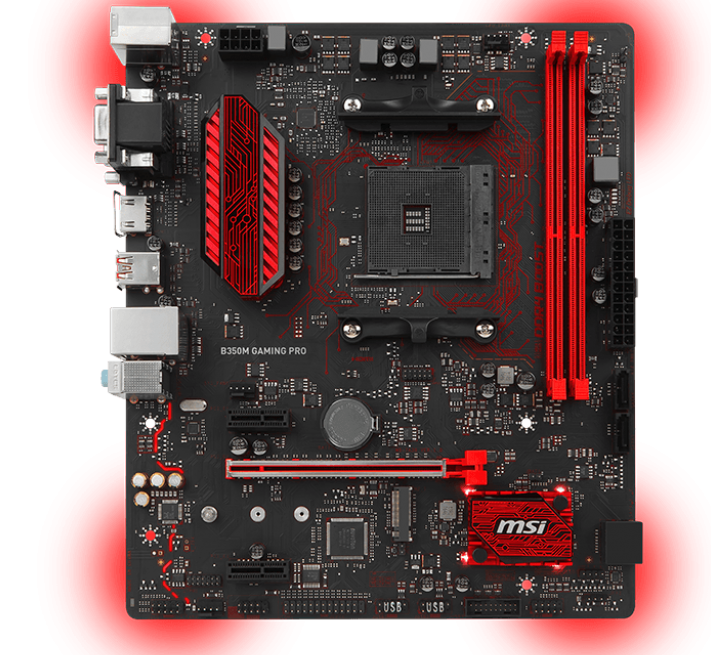 Focusing on the MSI B350M Pro Gaming motherboard, it does have a rather unadorned power delivery consisting of a 3+2 phase setup, which in turn wouldn’t make this as suitable for higher voltages than perhaps other models of a more premium nature than this. 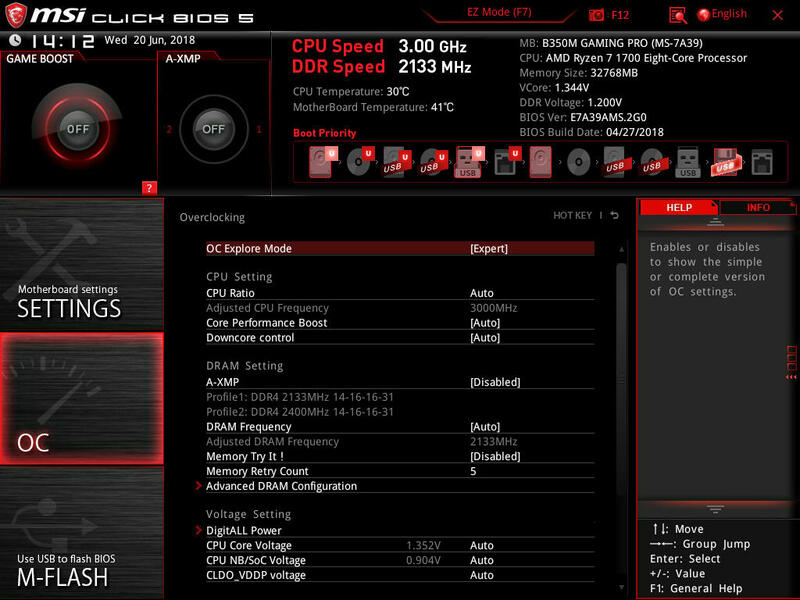 The MSI Click BIOS 5 resembles most other MSI BIOS versions of recent times and although the B350M Pro Gaming sits at the lower end of the market in terms of price, all the relevant and core settings are available to do some overclocking. The BIOS itself is easy to navigate around, with a simple press of F7 allowing for switching between the basic and advanced BIOS screens. The OC section has all the core settings for changing CPU core frequency, various voltage settings and memory too, including DRAM latency timings, as well as the ability to enable compatible memory’s XMP profiles. The CPU Core Voltage within the BIOS is hard locked to a maximum of 1.4 V; I am assuming this is to not overload the power delivery and at the end of the day, 1.4 V is more than enough for most overclocks without going overboard which will result in considerably higher power consumption and thermals. Users looking to go past 1.4 V on this board will have to resort to the AMD Ryzen Master Overclocking Utility which will allow for a maximum of 1.55 V, but this is not recommended at all. The best Ryzen 7 processors on ambient cooling can hit around 4.2 GHz while our sample can hit around 4.0 to 4.1 GHz depending on the quality of the board with between 1.375 and 1.40 volts. Although our Ryzen 7 1700 test bed sample has a limitation of around 3.9 and 4.0 GHz on all but the most overkill of boards, the B350M Gaming Pro performs as expected given the relatively inexpensive cost of $80. An overclock of 3.9 GHz was achieved with the boards allowed maximum of 1.4 V on the CPU voltage core and even though the load voltage jumped up to 1.44 V, it remained unstable during our POV-Ray testing. Users looking to overclock their Ryzen 7 processors whether that be the first or second iteration of the chips should only expect to apply overclocks with moderate voltages as the power delivery cooling on this particular model is somewhat poor for overclocking and during the testing, the svelte heatsink did warm up considerably. I am not confident the heatsink would hold up over long durations and with higher ambient room temperatures, there could be overheating problems down the line.